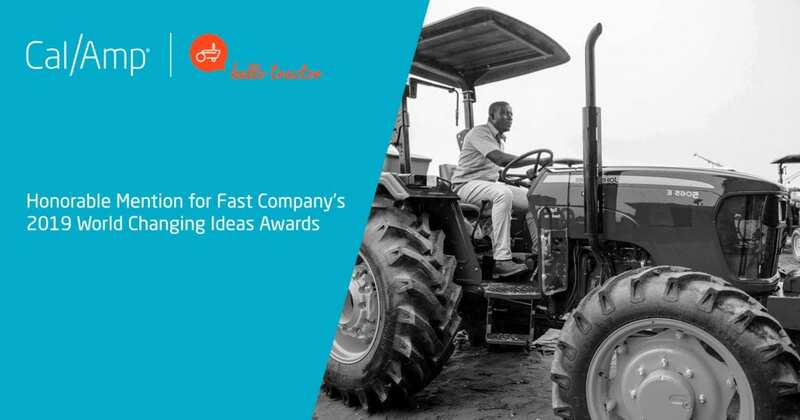 We are proud to announce that our collaboration with Hello Tractor received an honorable mention in the Apps and Developing World Technology category as part of Fast Company’s 2019 World Changing Ideas Awards, an award given to honor businesses, policies, projects, and concepts that offer innovative solutions to the issues facing humanity. With the largest submissions to date, Fast Company editors, writers, and some outside judges came together to choose the most powerful and creative technologies impacting the world. Hello Tractor, a first of its kind, Uber-like on-demand tractor service, is the result of a partnership between Hello Tractor, CalAmp and John Deere to bring affordable, best-in-class farm equipment accessibility to smallholder farmers in Nigeria and other developing countries. The cost of purchasing equipment can prohibit the ability of a farmer from developing efficient processes that can increase food production and income. With Hello Tractor, farmers are able to access tractors, on-demand, via agents within their community, promoting economic growth by putting more land into production and creating jobs across developing regions. More than 2 million direct and indirect jobs in Nigeria within a 5 year span – all powered by Hello Tractor, John Deere and CalAmp technologies. CalAmp’s telematics devices are being used across industries in construction, fleet management, automobiles, school buses, tractors, and more all over the world. Whether it’s business growth or providing innovative solutions to challenges, CalAmp and its partners are changing how business is done. Now in its third year, the World Changing Ideas Award by Fast Company evaluates technologies impacting the world with Health and Wellness, Education, and AI and Data among the most popular categories. A panel of judges from across sectors choose winners, finalists, and honorable mentions based on feasibility and the potential for impact. With a goal of awarding ingenuity and fostering innovation, Fast Company draws attention to ideas with great potential and helps them expand their reach to inspire more people to start working on solving the problems that affect us all. The 2019 awards featured entries from across the globe, from New Zealand to Shanghai to Switzerland. All of the finalists are highlighted in the May issue of the print magazine, which hits newsstands April 16, 2019. Please join us in congratulating all the Fast Company 2019 World Changing Ideas Award winners, finalists and honorable mentions innovating to solve challenging problems across the globe!